Summary for the Busy Executive: Beautiful music, beautifully realized. You won't believe your ears. When we think of electronic music, we think of slides, boops, squeaks, and so on. If we consider how electronic music developed, this is perfectly natural. Early electronic music was so primitive and required so much labor for even brief results (months for a pitifully few and stark minutes) that, since you had to build each note from acoustical atoms, the sounds never really got that far beyond the waves that generated them. The theremin, ondes martinot, and even the electric organ sound like nothing really other than themselves. With the arrival of MIDI and WAVE technology, the synthesizer, and the sampler, we come to the point where, with a reasonable amount of effort, you can have just about any complex, even "real-world" sound you want, and you don't have to be a physicist to get it. This may be the most profound technological advance in music since Petrucci and the invention of musical printing. The technology opens up so many vistas, I find it hard to begin. One, of course, is the creation of something utterly new and absolutely beyond human players. Composers are writing this way, although I confess that, in the abstract, I find this prospect uninviting and, indeed, rather unsettling. Historically, music has stayed around mostly because performers – amateurs and professionals – were interested in it. This essentially closes off that door and also turns music in on itself, away from public scrutiny. As wonderful a work as Varèse's Poème electronique may be (and in my opinion it's pretty damn wonderful), it's really known only to specialists and to cranks like me. The main way you hear it is privately. Every concert of pure electronic music I've ever attended has failed as a social occasion, if nothing else. Imagine a bunch of people in a (small) concert hall listening to tapes through Voice of the Theatre speakers, and then imagine all the fun we're having. However, composers have begun to use this technology to create more traditional work. Amateurs and weekend warriors use MIDI technology to create music their fingers won't let them play. In other words, the technology allows them to realize more closely the music in their heads. "Professional" composers (I use quotes because hardly anybody makes a living writing classical music) use their sequencing programs as virtual scratch paper or as promotional material to leave with performers and performing organizations. 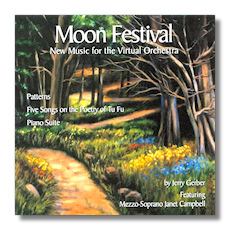 Jerry Gerber goes one step further: he creates a virtual symphonic orchestra or chamber ensemble as his final "product." He does so for several reasons. It's extraordinarily difficult for a composer of new music to get it played. Gerber cites a figure of 15% of concert "slots" devoted to new music. I suspect he may be counting music no longer new from composers either no longer alive or soon to become so. Certainly, in my city – New Orleans, Louisiana – the figure is much smaller. But Gerber lives in San Francisco, a place far more likely to take a chance. Even so, the odds aren't good. Gerber's final product is essentially a CD. But he differs from the composers of "music from Tralfamador" and those composers who leave their calling card. The final product is – no other word for it – incredible. Gerber (although he occasionally provides pure electronic "accents" as mainly exotic percussion) recreates the human orchestra of traditional instruments. This gives him an advantage over composers not as adept a mixing board or a sampler. He leaves the door open for performers. He doesn't need the orchestra, but an orchestra can nevertheless play his music if it gets the notion. And this is gorgeous music, for the most part. In fact, the music is so stunning, that I forgive Gerber his New Age-y liner notes. A great composer need not create or believe great philosophy. One, I should think, judges a composer by the music he writes. The New Age, I'm afraid, merely irritates me, so I'll pass over Gerber's notes on his work to the work itself. Gerber's idiom is wildly eclectic, and in many ways that eclecticism testifies to his artistic honesty. The culture he comes from is also musically eclectic. I hear in Gerber's music a little bit of Bartók, some Stravinsky, Ravel, Sibelius, and English symphonists as well as movie music, pop jazz, folk song and dance, and even kid song. It all comes together in a very convincing mix. Gerber's handling of rhythm especially impresses me, with a mastery of the phrase against the meter. This usually results in a feeling of freedom, that the music can range anywhere it wants without getting muddled or lost. In collections like this, I find it inevitable that I enjoy certain works more than others. Fortunately, I seem to prefer the more ambitious work. The symphony, cello sonata, and the songs just knock me out. The symphony particularly impresses, and I believe Gerber has just finished a fifth. It takes large breaths, and it shows a big artistic nature willing to take risks. The first movement – all eleven minutes of it – flows from first note to last and furthermore sports an unusual rhetorical structure. The final minute or so is both a surprise and logical outcome. The second movement, a scherzo, dances in 11/8 time. It's so well done that, had Gerber's note not informed me, I doubt I would have known. The slow third movement is a hymn that moves from great sadness to great power. The finale begins as a huge symphonic gigue, a bit in the manner both of Honegger and of Dmitri Tiomkin's music for Shangri-la. Formally, it strikes me as the least successful movement, the most piecemeal, but what marvelous pieces! The third and fourth movements share themes, but the themes don't seem to go together, contributing to the fragmentary feeling of the work. Nevertheless, Gerber manages to end well. The cello sonata strikes me as an homage to Copland, Bernstein, and the American vernacular. The first movement proclaims and stamps about angrily. The second riffs off camp songs and fiddle tunes – a delight from first note to last. If you listen carefully, you'll hear something familiar and yet astounding – astounding in the sense that Gerber thought to use it at all. I won't give it away. Buy the CD. Patterns, in one long movement, I had trouble with initially. That is, I knew what was happening, but I don't know why Gerber wanted it to happen. Nevertheless, I couldn't dismiss it, and my persistence paid off this time. Something extraordinary is going on. You probably don't call something Patterns unless there are some. Gerber takes a small idea and expands and varies it for twelve remarkable minutes – essentially what Beethoven does in the opening movement to the Fifth Symphony. It seamlessly (and Gerber's music doesn't generally show its joins) works through several moods, from an opening wake-up call to arms to a quiet, peaceful end. The pattern, easy to pick out, sometimes takes center stage, sometimes retreats to the background to make way for other ideas, many of which, by the way, are more complex offspring of the pattern. However, most of the piano music, though well written, left me cold. For me, it's mainly due to the sound of the virtual piano. It does indeed sound like a real piano, but not a real piano player. The touch is too heavy and too much the same. I miss the way a good human pianist makes the music "breathe." In my listening experience, piano is the most difficult instrument to duplicate by electronic means. Gerber does better with it as accompanist, as in the cello sonata, than as soloist. The Prélude and fugue for me lack poetry – that is, something beyond the technique of their composition. The suite, in twelve movements (each suggested by a month of the year), succeeds more with me, although I don't always get the emotional connection between the month and the music. Perhaps the seasons in New Orleans differ too much from those in Frisco. A human player might change my mind. No misgivings at all about the 5 Songs, settings of Kenneth Rexroth's translations of Tu Fu's poetry. Gerber has chosen his texts very well indeed and has fashioned dazzling music for them. To some extent, the songs constitute an exercise in chinoiserie, closer to Ravel's "Laideronnette" and Stravinsky's Rossignol than to Mahler's Lied von der Erde. Gerber also tries to get closer to an "authentically" Oriental sound with synthesized koto and erhu. The chamber instrumentation, which also includes harp, English horn, a Bolivian instrument called a sicu (I've no idea what this sounds like), solo strings, discreet percussion, and sampled sound effects from nature, gloriously works together. Indeed, it almost, but not quite, steals the show from the singer and the texts, but Gerber, like Mahler, manages to tie the ensemble's sounds to the words. These are real songs, an inextricable nexus of music and text which creates something greater than either alone. Mezzo Janet Campbell doesn't have a large voice, but she is one fine singer and musician. It couldn't have been easy coordinating her part with the phantom instruments, but you don't hear the effort. She sings in the service of meaning and communication. Loved these songs. I hope I've whetted people's appetite for this music. If you're worried about how "modern" it is, it's no further out than Walton. The sound palette has merely expanded a bit. Some of Gerber's CDs are available at the usual suspects, but the primary outlets are at CDBaby and various Tower Record stores. 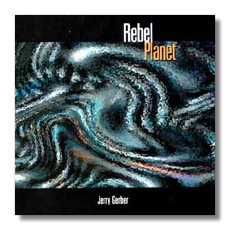 You can also access some of them at the composer's web site (http://www.jerrygerber.com/).